Women and Microfinance in the Global South achieves what many qualitative researchers who have tried to persuade economists and politicians of the validity of their work may well view as a Holy Grail: a systematic review which allows qualitative research to be accorded the rigour, scale, and significance needed to influence policy. In an environment in which qualitative research is frequently seen as context-specific and, erroneously, dismissed as ‘anecdotal’, Lynn Horton’s evaluation of qualitative studies of microfinance should have resonance across the many debates on what evidence ‘counts’ in assessments of development outcomes. Her innovative approach makes a key contribution to the methodology of systematic reviews, and offers a comprehensive and particularly well-referenced summary of qualitative work on microfinance to date. The potential for microfinance to empower women has been discussed at length for decades, and it may seem to many that the field of enquiry is saturated. 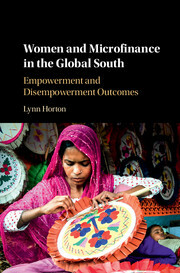 However, by comparing and contrasting cases from across the global South, and producing a robust framework via which to understand the relationship between gender, empowerment, and microfinance, Lynn Horton offers something new. The opening chapters review the literature on the history and development of microfinance in relation to neoliberalism, empowerment, and scholarship on the potential of microfinance to transform gender relations, both positively and negatively. Helpful diagrams lay out the proposed conceptual frameworks very clearly, as Lynn Horton develops distinctions between ‘market empowerment’, a way of working that is about extending the market and assuming empowerment comes from there, and ‘transformative empowerment’, which recognises that exploitative structures – particularly gendered ones – need to be challenged directly. Perhaps unusually, one of the most interesting contributions of this book is the methodology, developed in Chapter Three. The statistical methods required to collate, compare and scale up qualitative studies are complicated and arguably inherently contradictory. As such, qualitative work is often excluded from systematic reviews. In terms of understanding the transformative potential of microfinance, particularly regarding the empowerment of women – possibly the industry’s main selling point – this has been a critical loss, which has reinforced a reductionist, economistic emphasis on quantifiable indicators. The weight of quantitative evidence indicates that microfinance has not had the beneficial effect on livelihoods, incomes, and empowerment that is claimed, and Lynn Horton cites the excellent work of Maren Duvendack et al. (2011) to make this point. However, the current trend against microfinance is so focused on economic arguments that it risks further compounding gendered exclusions, and returning to a gender-blind approach to income generation and development. In this context, Lynn Horton’s review of qualitative evidence is timely. Chapters Four and Five offer a typology of different institutions based on women’s experiences that does not shy away from the complexity of the terrain: ‘NGOs [are] not merely…conduits for global microfinance policies, but organisations embedded in specific national and historical contexts, with their organisational values and interests’ (p. 42). Chapter Five breaks down the reasons microfinance NGOs target women, a theme which has been amply covered in literature on microfinance. However, the geographical variation of the studies reviewed here makes a compelling argument for taking context into account in assessing microfinance’s potential to empower women. Local configurations of neoliberal and patriarchal norms are crucial to understanding how women beneficiaries use their loans. The following two chapters explore how structural influences within the ‘private’ sphere of the household and the public sphere of the market influence the economic outcomes of microfinance for women. The aim of Chapter Six is to ‘provide clues to a more nuanced scenario in which women’s microfinance motivations, goals and outcomes do not neatly parallel a business model of unfettered consumer choice’ (p. 79). Factors include power and autonomy within marriage and the household, and patriarchal norms and values. Chapter Seven discusses how these ‘private-domain’ issues influence women’s experience as entrepreneurs in the market. The collective aspects of microfinance are the subject of Chapters Eight and Nine, specifically dynamics of co-operation and competition in the group setting, and the tensions between maintaining entrepreneurial acumen and the caring, altruistic expectations of women in the group setting. Lynn Horton demonstrates the consistency of this dynamic around the globe. Chapter Nine looks at political empowerment and how women’s participation in microfinance groups may constitute a platform for further mobilisation on gendered norms and rights, and the complicated effects that increasingly dominant ideas of ‘market empowerment’ can have on this potential. Vital points about the social pressures surrounding women’s self-exploitation, and men’s gendered and outward-focused aggression, make a compelling case that gender-transformative microfinance can not only be about targeting women. The final two chapters offer synthesis and conclusion, and return to the three characterisations of microfinance that have structured the book: microfinance as a ‘market-centred anti-poverty intervention’, as a depoliticising ideological project, and a facilitating instrument for global change. Lynn Horton argues that there are elements of truth to all three of these characterisations, and it is clear that for microfinance to maximise its potential for transformation, the importance of gendered dynamics within the household, groups, institutions, and the international development community need to be the explicit focus. The themes covered in Women and Microfinance in the Global South will, of course, be familiar to researchers in the area, but this book is remarkable for its nuanced synthesis, which brings out diversity and complexity without losing sight of the structural issues involved. The analysis, refreshingly, does not rely on monolithic constructions of ‘microfinance’ or ‘neoliberalism’, but rather focuses on the potential for microfinance to contribute to gendered transformation and empowerment in particular environments. Women and Microfinance in the Global South constitutes an invaluable aid to students, researchers, and practitioners alike, and it will be very interesting to watch what impact this book will have on development research, and the validity and importance which is accorded to qualitative academic work in policy circles. In the era of big data and financialisation, it seems that the evidence base for ‘what works’ is becoming increasingly reliant on quantitative indicators and models that can operate on a global scale. Lynn Horton’s systematic review counters some of the epistemological objections that are often used to sideline qualitative research, but there are political reasons why this work may still not receive the attention of decision-makers. Her recommendations do require that assumptions behind neoliberal models of development be questioned, and her emphasis on participation and the importance of local context requires local decision-making, at a time when financial institutions are more powerful and global than ever. Lynn Horton’s incredibly thorough methodology addresses epistemological objections that are often levelled against qualitative research, but the political reasons why qualitative studies, and their penetrating critical potential, are frequently marginalised, remain in place. Science Research Unit, Institute of Education, University of London.